Any real New Yorker knows that Midtown isn’t a very desirable place. You have to merge into the flow of humans like you’re on I-95, there’s homeless people at every corner, euro tourists with strange fashion sense, American tourists with even stranger fashion sense, etc. etc. There certainly aren’t many great restaurants in Midtown, but since there is such high demand for a quick lunch, there are a lot of decent cheap eats. One of my favorite types of cheap eats are the quintessential food trucks. Fridays on 46th street bring in at least 5 food trucks, one of which serendipitously served hot dogs. So, I left the office with the Stable crew, put my blinker on, merged on to fifth avenue, passed a gallery of talented Asian tourist photographers, and found my way to the first food truck I’ve ever reviewed. What is that? What is that green stuff on the weenie? Ladies and Gentleman, let me introduce you to relish. 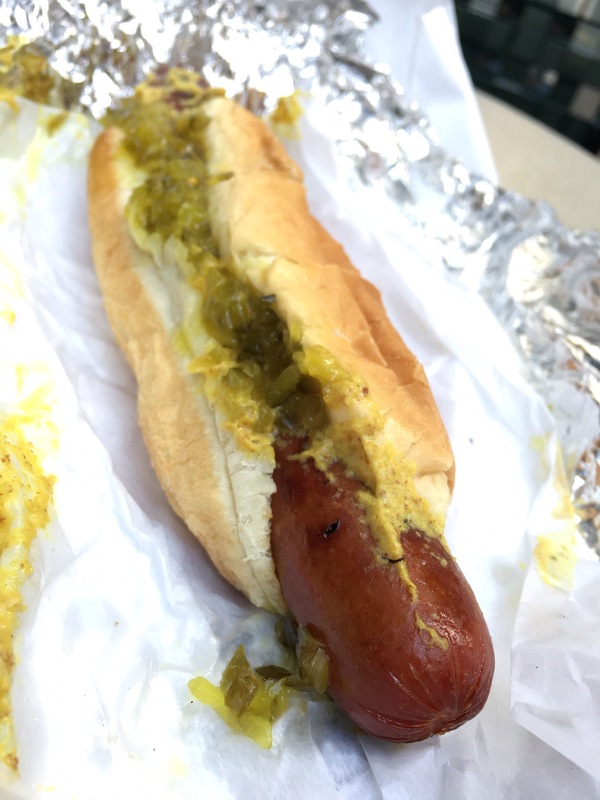 I can’t believe this is my 13th post and this is the first time I’ve had relish on a hot dog. Relish is one of the best condiments to ever be placed on a dog. It’s the only condiment for which the following sentence is gramatically correct: I have a relish for relish. It’s a classic that I fear may be fizzling out. Kind of like pogo sticks – what happened to those?! They’re amazing, just like relish. Sweet, yet tangy, juicy, yet smooth, relish is a wonderful compliment to mustard. Relish. Say yes to the dress…ing. Now for the sausage itself. This was a fat boy. I’m reminded of Big Nick’s, which I recently reviewed, but this one is juicier. It is literally too big for the bun. That bun can’t feel good about itself. I am willing to look past this obviously unhealthy relationship and just think about taste. The dog itself has a kind of unique smoky flavor that I definitely liked, but it was almost too meaty. There was no snap, and it didnt seem too fresh. The bun was pretty good, but not great. It reminds me of that friend you have that you only invite to big events, but you never really just hang out. He or she doesn’t leave a lasting impression, but you say “oh, it was good to see _______”. They get picked somewhere in the middle in backyard football. For 3 dollars this was also a bargain. 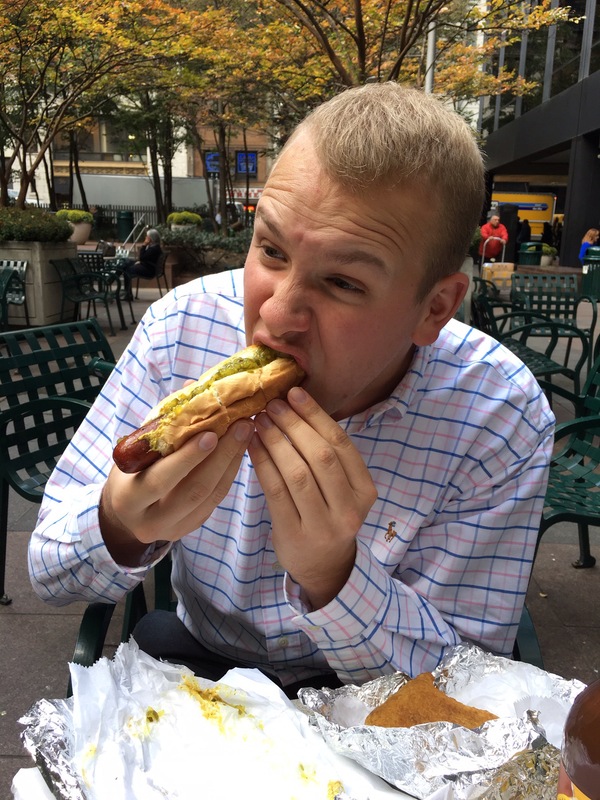 You would be straight silly to not spend three George Washingtons for this hot dog. I also was able to eat my first knish from this place. I know it’s off topic, but those things are pretty awesome. They are just a fat fried Jewish hunk of potatoes. (No, I’m not talking about Eli…) Anyway, the staff at the food truck were great and they definitely specialize in pastrami, which we were allowed to taste, which was very good. Overall, I enjoyed the hot dog and was happy to see that relish was a featured condiment. This to me was like seeing Eddie Murphy being funny again. I was elated. I would definitely return. Thanks Deli and Dogz. 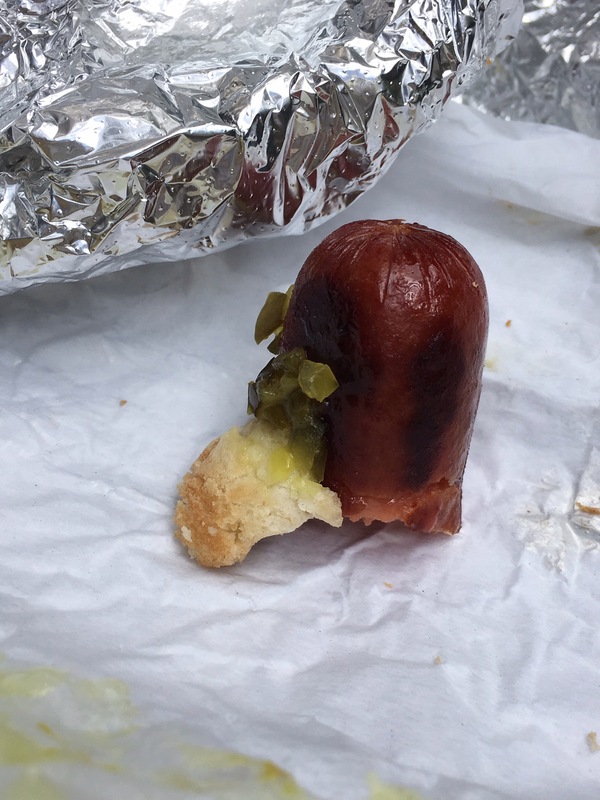 My favorite moment of this lunch was when I looked down at the last bite of my hot dog and it was sitting vertically, with a small piece of bun and relish sticking off the side of the sausage. I couldn’t help but think that it looked a lot like Donald Duck. I’ll leave you with that. One of my most anticipated things to do when I go to New York is to eat a Hot Dog from a food truck.. We actually don’t have those here in Australia and they are always on American TV shows haha.. I am also with you on yumminess of relish.. I actually had forgotten that it exists, but is is amazingly delicious! Try it on a leg ham sandwich one day, yummo!